Mulhern Gas Company provides “green” and clean propane energy. Propane is one of the cleanest fossil fuels and an approved clean fuel designated by the 1990 Clean Air Act and the Energy Policy Act of 1992 and 2005. Environmental Protection Agency tests show that propane-fueled vehicles produce 30 to 90 percent less carbon monoxide and about 50 percent fewer toxins and other smog-producing emissions than gasoline-powered engines. Millions of Americans use propane every day in and around their homes to operate furnaces, water heaters, outdoor grills, fireplaces, and other appliances. On farms, propane is used to drive irrigation pumps, dry harvested crops, and control pests. 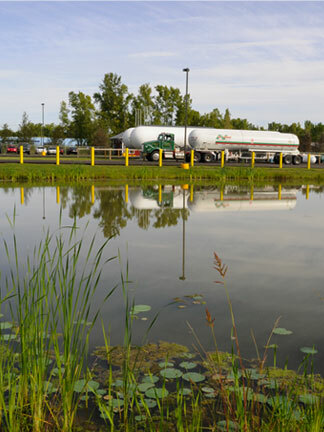 Commercial uses for propane include fueling forklifts and fleet vehicles. Propane is used by many different types of enterprises, including restaurants, hospitals, and hotels, for heating, cooking, and standby power. Propane-powered water heaters produce 60 percent fewer greenhouse gas emissions than electric-powered models. Propane tankless water heaters can cost up to 60 percent less to operate than electric models.Propane furnaces emit nearly 70 percent less greenhouse gases than electric furnaces.